Imagine that you find a mysterious old computer, perhaps in a basement or a garage. When you boot it up, the "Tesselated Intelligence System"—or TIS-100—displays a copyright dating back to 1972 and an error message: "CORRUPTED SEGMENTS DETECTED, INITIALIZING DEBUGGER." You're taken to a self-test diagnostic tool, where you have to create new programs and rewrite the corrupted code in the machine, with a little help from a photocopied computer manual straight out the 1980s. This is TIS-100, which bills itself as "the assembly language puzzle game that nobody asked for." Created by Zachtronics, the company best known for Spacechem and Infiniminer (aka the precursor to Minecraft), it caters to some highly specific tastes involving nostalgia and coding. In order to debug the code, you're given a grid of twelve programming nodes and tasked with taking certain numerical inputs and turning them into certain numerical outputs, using the language spelled out in the manual. Within each puzzle there's a debug button you can push, which doesn't seem to debug anything but instead displays strange, disjointed messages, either from the former owner or the creator of the machine itself. Who made the TIS-100, and why? What is it really for? The game suggests the answers will be revealed after you finish debugging, although I can't say for sure because it's super hard and I haven't beaten it. Like a lot of coding problems, there's more than one way to solve each of the puzzles, and already plenty of people online who want to share and debate their solutions. 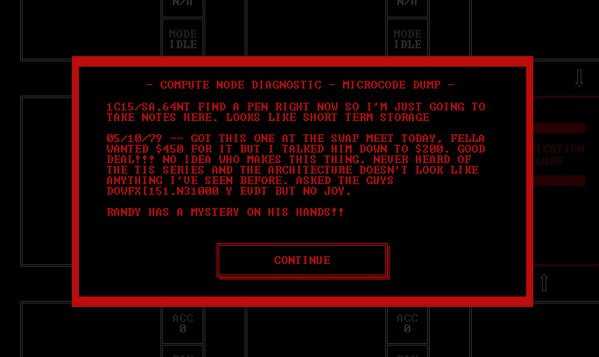 There's also a sandbox option where you can create your own TIS-100 puzzles, and use them to frustrate other players. But be aware: This is most definitely a game for the programming and mathematically inclined—or at least people willing to work really hard and stretch their brains in that direction. Although I can fake my way through HTML and a little CSS, I'm not much of a programmer, and the learning curve for TIS-100 felt steep to me indeed. If you're not sure whether or not the game is for you, try reading the "manual" for the TIS-100 that comes with the game as a PDF, or watching a tutorial on Youtube. If it seems fascinating or makes you nod your head in understanding, proceed with confidence. If you feel like you've been catapulted into one of those nightmares where you suddenly have a math test in a class you've never attended, perhaps another game would be a better fit. TIS-100 is currently available on Steam Early Access for Windows, OSX and Linux, and a final version is expected in several months.